One year ago this week, I made a huge leap and left my job to work full-time for myself. It was a huge risk, but this year has been incredible. I have learned so much about what it takes to run a business, to be an artist and designer, how to manage my time, how to handle success as well as failure, and have had an amazing time doing it. 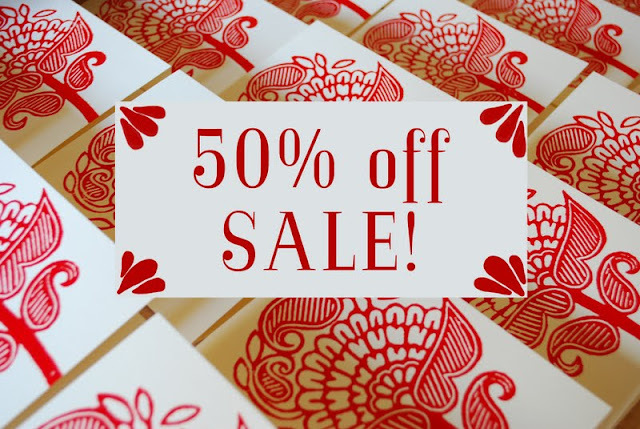 In celebration of my one-year anniversary of being fully self-employed, I will be having a huge 50% off sale this Friday from 7am to 7pm! That is twelve hours to get everything in the shop half-price! This is a one-time-only celebration sale, so this Friday is your only chance to get everything you've had your eye on in the shop for a full 50% off the original price. Just use the code "SALE50" when you check out on Friday only, and receive 50% off your entire order. Happy shopping!